symptoms associated with this illness. Some not only help with pain relief, but can also promote restful sleep and improve your energy levels as well. Dealing with chronic pain and fatigue can have a tremendous effect on your overall physical and mental well being. It causes irritability, lack of energy, and sometimes severe depression. This is why many doctors recommend a specifically designed fibromyalgia medication that can tackle all or some of these symptoms at the same time. I've never been a huge proponent of pharmaceutical medications, but I do have to admit that they helped me tremendously while on my crusade to find a more healthy solution. Now, I realize they are considered by some to be synthetic bandages that have dangerous side effects, but if it wasn't for the medications prescribed to me when I first began treatment, I would have never been able to function, let alone get out of bed. Many people are still using them today with great results. 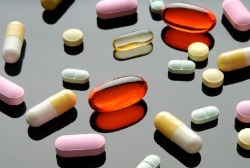 Below is a list of the most common fibromyalgia medications being used today. Many times doctors will prescribe a combination of these medications for fibromyalgia to help battle pain, relax muscles, and to also help you obtain more restful sleep. Some of these medications are fairly new and have not been on the market for very long, and some have been around for years. Regardless of the pharmaceutical industries less than glamorous reputation, I personally believe there are a select few dedicated scientists and chemists that are determined to find solutions to the many forms of chronic pain people are experiencing. And I say this with a non bias opinion, because I have no family or friends that work in this industry. Considering the staggering number of people living with chronic pain in the world today, I don't think it's too farfetched to believe that some of these scientists know someone or have family members that have been affected in one way or another by chronic pain. And I'm sure in their own minds they feel strongly that chemistry can be one of the possible solutions. Of course, the side effects mentioned in the disclaimers on TV are not very appealing, but some have been on the market for many years and are helping thousands maintain a fairly productive life. For people that want to avoid any type of prescribed medications, there are other alternatives such as guaifenesin and other fibromyalgia supplements being used today with great success. There are plenty of choices out there. that regularly treats patients with this illness to discuss the best options for you. They have documented numerous cases, and are very knowledgeable when it comes to drug interactions and correct dosages.